Leaks can develop in the plumbing system due to its frequent use in our daily routine. It is necessary to take immediate action in case a leak is detected. You can make temporary repairs yourself to control the situation and then call Dr.Pipe plumber to look things over and fix the system to avoid further problems. If you have converted your basement and added a bathroom, you must make sure that all the connections of the drainage system are secure or leakages may develop and might flood the entire basement if they are severe. Basement leak detection and repair can cost a little or a lot depending upon the severity of the problem. Leaks can occur in the main water line, faucets or pipes. 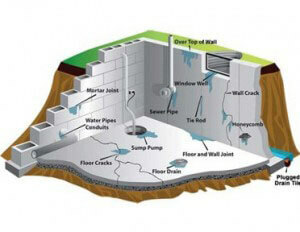 Basements leaks can be detected by looking at the water meter in your house. It is usually located near the water heaters. Water meters have dials that move in case of a leakage. If the dial of the water meter is moving rapidly, this means that the leakage is severe. If the dial moves slowly, then it indicates a minor leakage in the system. You can check for any water puddles on the floor of the basement as an underground leakage often results in water seeping through the cracks or weak areas in the basement floor. For effective basement leak detection and repair, it is essential that the problem should be diagnosed properly. If a problem is misdiagnosed, it may aggravate the situation further. Hire a professional to do the job as it is often difficult to diagnose a problem in a finished basement because the source of the leak is not visible. It is easier to detect the source in an unfinished basement and the repairs can be carried out immediately. The first thing to do in case of a leakage is to stem the flow of water. It can be done by turning off the main water valve of the house. As an owner, you must know where the valve is located in order to deal with an emergency like this. In order to repair the leakage permanently, you should call a Dr.Pipe plumbing company as a professional is always better equipped for the job. You can also apply liquid asphalt with synthetic rubber or any other water proofing material to stop the leakage. It must be kept in mind that if the leakage is new, then it can be repaired easily by water proofing methods. If, however, the leakage is old then there is a chance that the foundation of the house might have been damaged. Basement leak detection and repair services are provided by a number of companies that provide professional services with their advance methods of basement leak detection and repair. If the leakage is serious and there is a chance that the place might be flooded, then it is better to look for a professional to do the job for you.